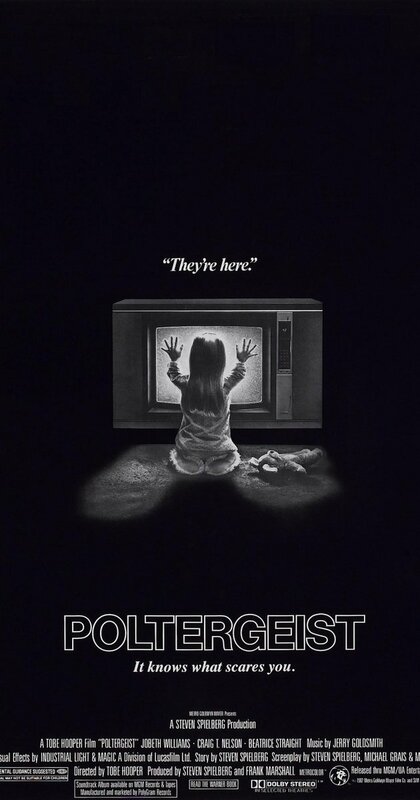 “They’re [still] here!” 35 years later, Stephen Spielberg and Tobe Hooper’s Poltergeist still terrifies audiences today. Coming off the successes of Spielberg’s Jaws & Close Encounters of the Third Kind and Hooper’s Texas Chainsaw Massacre, this powerhouse producer-director team (note: Hooper received the official director credit) crafted a horror film that became an instant classic then, and still holds up today. With Spielberg heading up the story and Hooper in the director’s chair, both cinematic geniuses combined their talent for generating material for nightmares to take the “haunted” house film sub-genre of horror to the next level. Storytelling and cinematic elements aside, another primary reason the film still haunts and intrigues audiences today is the lore of a lengendary curse attached to this film. For audiences back in 1982, and possibly still to this day, following watching the film, friends may have found themselves only venturing by an alleged haunted house on a dare. The film’s impressive ability to take the haunted house concept up to a level never seen before–in fact–it essentially created the modern haunted house genre seen in today’s horror films. In short, Poltergeist is an icon, and stands alongside films such as Psycho, The Exorcist, and The Shining. Probably the most terrifying element of all is the setting–mundane upper middle class America suburbia. No longer where “haunted” houses confided to old mansions or hotels, but could be located next door to you. That is, if your neighborhood is also built upon a burial ground. At the end of the day, regardless of who actually directed this film, Poltergeist remains one of the strongest films in either Spielberg’s or Hooper’s canon. And the legend of a curse certainly doesn’t hurt the strong fanbase of this horror classic. Curse and directorial authorship aside (though, the latter is a valid topic for discussion), the brilliance of this film is almost self-reflexive in that it displays quite the dichotomy while commenting on the secularized versions of heaven and hell as seen in the film due to both having their due screen time. This bifurcation paves the way to read past the ghostly apparitions and (real) skeletons, to the root of what I feel Spielberg and Hooper were foreshadowing as the real threat to a traditional familial bond–that box in your living room with moving images flickering on the screen. The way the movie opens and closes are very much book ends to one another as it attempts to deal with the quandary of an inability to “choose between life and death, when [we’re] dealing with what is in between.” The foreshadow of the seemingly one-sided conversation between Carol Ann (the late Heather O’Rourke) is a great depiction of how families are today. The kids are entertaining themselves by and form connections with characters seen on the TV while mom and dad are in their own world getting lit. That is not unlike what is seen today. Now, keep in mind, televisions are not responsible for fracturing the nuclear family; but the television is often relied upon as a babysitter and becomes the object that receives the most attention to the point that some get sucked into the moving picture world. Perhaps there is a lesson here in that the television should not be the center of attention in a household. Poltergeist has much in common with a roller coaster at a theme park, and that metaphor can can aid in explaining why a film with such a simple plot and one-dimensional characters was and still is so incredibly successful in terms of cultural references and the fan base today. Why do most people go see a horror film? Is it the complex plots and multi-dimensional characters with brilliant on screen chemistry and excellent development? Not particularly, as great as those things are AND are often found in the best horror films. The pacing of this film reminds me of the pacing of a roller coaster at a theme park because of the lift at the beginning, the plummet into danger, the feeling that it’s almost over, followed by one final plunge into the twists and turns before pulling into the station. Compared to films such as The Conjuring, American Psycho, and Nightmare on Elm Street (not to mention many others), the plot is somewhat nonsense; however, the film is–without argument–sensationally effective, terrifying, memorable, and the horror imagery is beautiful–filled with metaphor and familial commentary. It’s an impressive array of haunting visual effects juxtaposed against a typical American family living in the suburbs. That, and ever since this movie, static on a TV is frightening! If you can find it anywhere anymore. With all channels on 24hr programming now, I suppose that the ghosts have to find another way into our world. The innocence of the characters is also an intriguing and atypical part of this movie that aids in the frightening imagery and nightmarish inducing apparitions. It’s atypical because the victims of death, haunting, or injury in a horror film are usually horny teenagers who are sexually promiscuous, adults who have skeletons in the closet, played God, broken the law, or just plain old sociopaths. Not true with this family. Everyone in the Freeling household are wholesome family members from the hardworking father who wants the best for his family to stay-at-home mom who loves her kids, and even the siblings who appear to get along just fine. Almost too picturesque, and ultimately a bit unrealistic. Despite the tight, healthy nuclear family, the Freelings are thrown into chaos when Carol Ann gets sucked into the world that exists between life and death behind a thin veil. That innocence helps to uncross the level of terror in the movie because it hits members of the audience that no one is safe from the reigns of evil. The fact that everything in the film happened to a normal family creates added anxiety in the minds of the audience as many go home to a similar world first depicted in the movie. Looking back, Middle American must’ve been completely shocked when a family, not unlike its own, was plunged into a world of hellish gateways, ghosts, and ghouls and other circumstances out of its control. There is something for everyone in this film. Because it is likely that most in the audiences then and now are afraid of something in the film: unexplained physics-defying phenomena, clowns, the underside of the bed, ghosts, closets, scary trees, pools, or subdivisions. Perhaps the relatability to the characters or the scary elements of the film are what help to connect new audiences to this classic horror film. There is a wittiness about the film that reminds me of something that Alfred Hitchcock may have developed for the screen had he ventured into paranormal movies. As nightmares go, Poltergeist is thoroughly enjoyable because you know your an always wake up from it and none of the characters are permanently damages at the end of the film. Eerie, beautiful, gruesome. That’s why this film still holds up today and will continue to haunt audiences for many years to come.